The Living Earth More than Mulch is a non-floating Rain Garden mulch. Included in the blend is Living earth Organic certified Compost which anchors the mulch so it will not float and block drains. Compost adds nutrients over time to the raingarden soil beneath and suppresses weeds, promoting successful plant growth. This mulch blend rated highly with Landcare in their study of mulch performance when gardens are flooded. Placed over a hard difficult soil, the compost in More than Mulch works down and interacts with it, encouraging worms to the surface to 'open up' the texture. Coloured mulch may potentially stain. 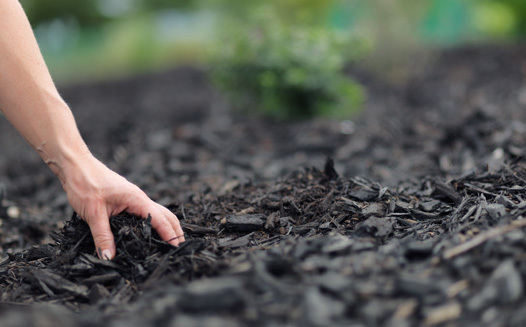 Although we make every effort to ensure that our coloured mulch is dry, we are unable to offer any guarantee that staining will not occur if blown next to sensitive areas i.e. house walls, concrete driveways etc. Ensure you protect these areas with plywood sheets or similar. Living Earth accepts no liability for any damage caused as a result of unprotected areas.